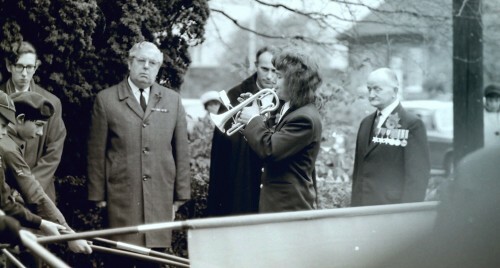 This photograph was taken on Remembrance Sunday in the Memorial Gardens in the early 1970s. The gentleman with the white hair and medal ribbons is the Baptist minister, Pastor Cooper. Next to him (behind the bugler) is the Reverend Robin Everett. The gentleman on the right, wearing a fine number of medals is Arthur Wheldon. He was a staunch member of the British Legion and fought to stop the traffic on Remembrance Sundays for the 2 minutes silence, when the A6 was the main road and extremely busy. His photograph was recognised by his daughter Ann Brown nee Wheldon. Missing information: Can you identify any more people in this picture?